Photo gallery hosting can be Free or nearly Free with various Cloud based and Free Softwares. It is possible to run a website that has your photos with no cost. The ways are practically written before, we are mentioning some with some links towards our old tutorials. Free Photo gallery hosting – the phrase itself is quite inviting and today, it is really possible to have without any marketing gimmick at all. For PaaS based hosting, you can use RedHat OpenShift, Heroku Cloud, App Fog etc. You can directly create a PHP App and serve the files or can install WordPress on them. Search our website (notice the search box) with your intended way. There are all kind of guides. Only issue is that, you will have a bigger domain name, you can use dot co dot nr free domain to make them smaller. The cost is, however fully zero. Apart from using OpenShift or Heroku Cloud or App Fog, you can use Rackspace Cloud Sites – Serving Full HTML Website From Rackspace Cloud Files CDN. We are taking that, you will register a domain. The total cost is practically next to nothing in all cases. The cost-benefit ratio is not bad as far you do not need a professional setup. This Article Has Been Shared 6578 Times! 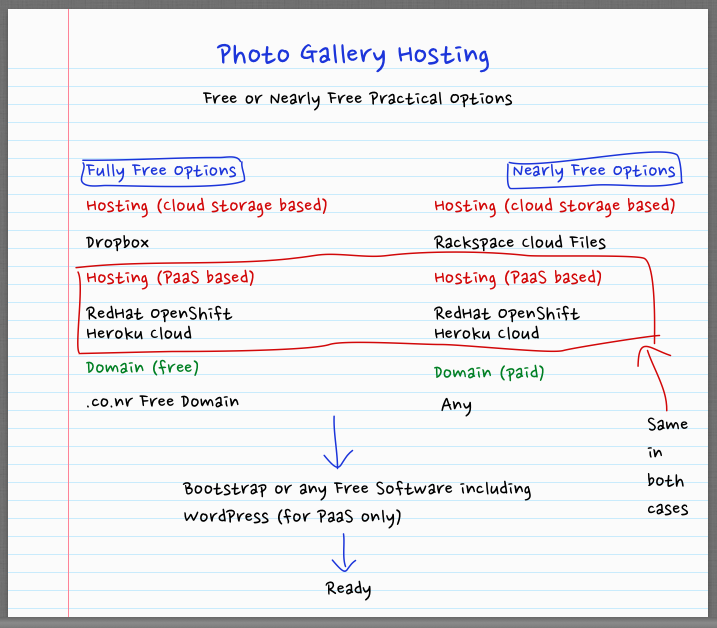 Cite this article as: Abhishek Ghosh, "Photo Gallery Hosting : Free or Nearly Free Practical Options," in The Customize Windows, November 9, 2013, April 18, 2019, https://thecustomizewindows.com/2013/11/photo-gallery-hosting-free-or-nearly-free-practical-options/.